The theme of the sea, like the sea itself, would seem to be endless. There is no man who saw him and would remain indifferent to the sea. But Aivazovsky knew how to “talk” about this beautiful miracle of nature in his own way – through pictures. He could pass on his love to others. An example of this is the picture “Ship offshore”. Why does the view stop instantly on all the details, what do I want to see there? What did the author want to say about this picture, and could he? The first thing I noticed when I saw the picture was, of course, the ship itself. Despite the fact that the ship is moored, it seems that it is moving somewhere. Such a huge force of dynamics is embedded in the whole image of the ship. His sails are raised, the flag hovers like a bird, and even boiling waves pull him forward. The sky itself, as by unsung agreement, acts in concert with everyone, and also does not remain calm. I could hear the picture. And the sound of the sea, from which everything inside is filled with anxiety and pacification. And the cries of coastal seagulls, calling, frightening sounds. And even the sky conveys the alarm. Only the gentle voice of the distant sailboat calms, speaks of the future. The artist, portraying the ship, focuses more on the storm. On the unrest that he carries. Even those who are ashore have many reasons for concern. Therefore, a small vessel that has almost survived the elements and is about to emerge victorious in the struggle with nature, serves as a perfect example of steadfastness and strength. Why can you believe in a near future deliverance? The sky is already starting to peer through the veil of gray-green clouds. Here it winks hope all survivors. 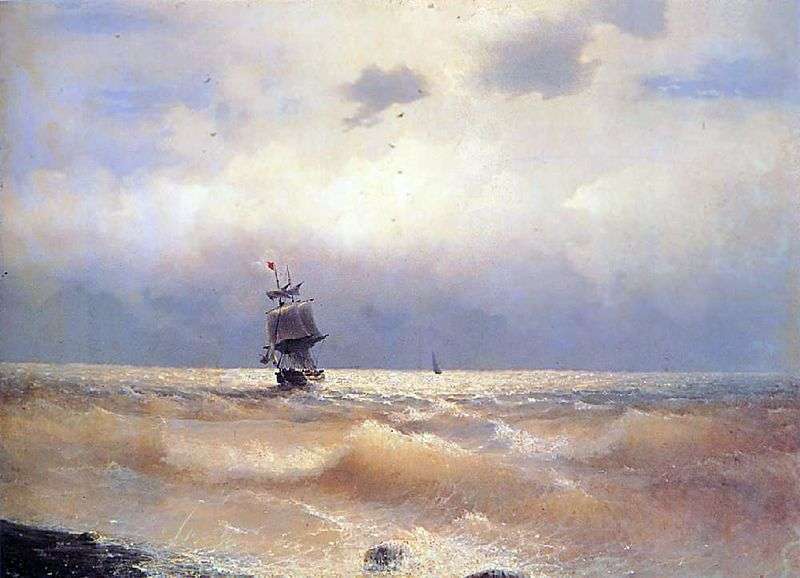 Description and meaning of the painting Ship near the shore by Ivan Aivazovsky.